Firstly, very many thanks "Alennka" and "My Wee Life" for passing an award to The Tenement. I'm so pleased you like what I'm doing with this. 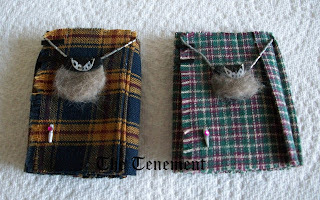 I've still to decide who to pass it on to and should have that sorted out for my next post but in the meantime, I've been making a couple of kilts. They're not for inclusion in The Tenement but are part of another little project I'm working on but I figured given that they're a Scottish item, this was the best place for them. I've no idea what the tartans (or if they are specific tartans at all). I got the fabric at a recent fair and basically had to take what I could get! The kilt pin was made from the top of a cocktail stick, split in half and painted silver. The decorative stone on it was liberated from a top with sparkles!! The sporran is made from a circle of leather, a piece of cut up jewellery and fur - yes, real fur! Thank you Thomas for supplying the fur. Sadly he's no longer the big bruiser that he was. (That pic was taken four years ago). He's now a wee old man aged 20. La tela es preciosa y tus hijos muy guapos! Your kilts are perfect. I love them. Your sons are very handsome. You've made a braw job Irene, the fur has worked a treat! Can't wait to see the project finished! Take care! Loving the laddies!! Love the wee kilts, very clever. You've helped me along with ideas here, I was floundering somewhat, dithering over the plaid. Can't seem to find our tartan in anything like small enough, having seen your kilts I'm more confident to use the available plaids. Beautiful kilt, beautiful cat, beautiful children,... everything is beautiful here! 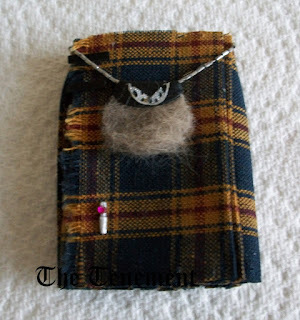 : D Hello Irene, Monday will start at a time of your beautiful Scotland my package. See you soon! Your kilts look wonderful and so do your kilted sons! Did you have to give Thomas a trim or were the fur samples the ones you get every time a cat sits on your lap?! 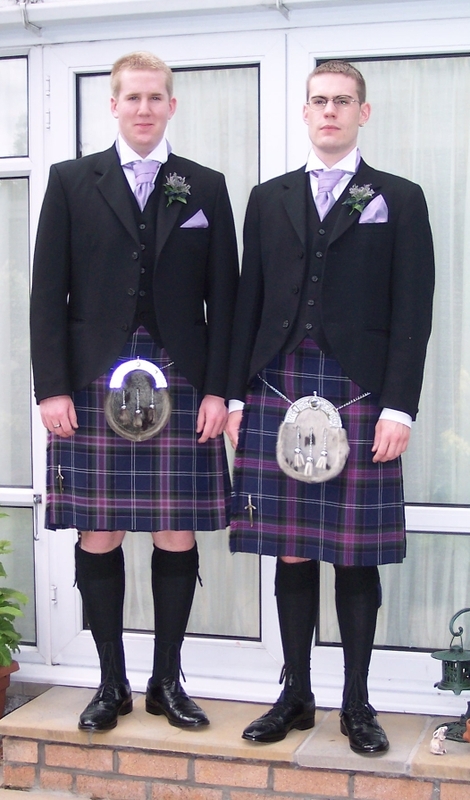 Oops... meant to say kilts, not kits. What a sweet pair of kilts and a bonny wee sporran too!! My sisters both wore kilts when they were in a female pipe band as girls, though I have never quite had the urge to wear a kilt myself! I saw my clan tartan recently and thought it was horrible! Oh well, I do like both of yours!! Now I am curious to know where they are going to be used!!? This kilts look very good, love the fabric love Scotland, look out for your little project. Great job on the kilts, Irene! I LOLd when you mentioned your 'fur source.' You must be proud of those boys of yours! Sorry Im so late. What fabulous creations!! The kilts are fantastic! I love the tiny pleets. 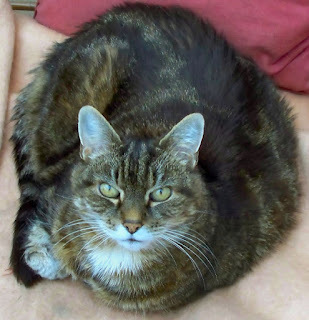 Like John, I chuckled when I saw your lovely old cat, such a cutie! Your Sons are dressed to perfection my dear. If we didn't now these were miniatures you'd swear you weere looking at pictures of the real thing. And using the cat, very creative! Terrific job. Your sons look very handsome indeed. I'm so pleased you all like my little kilts. They were fun to make and didn't take that long. Poor wee old Thomas isn't really looking after himself the way he used to and needs regular brushing now - the fur came from the "brushings". The "project" will be revealed in time - but for the moment I can tell you it has a definite Scottish slant! Hi Irene, The joke goes, that when asked by a tourist what was worn under the kilt? 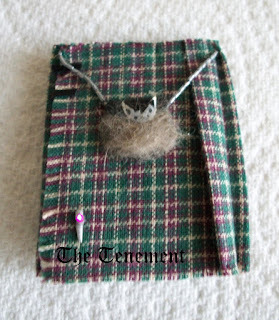 The Scotsman replied; "There is noth'in WORN under the kilt, it is all in Ver...rrrra, Ver...rrrra good condition!!! ( I thought that was cute) I love your kilts and the way you have included all the detail that makes them look sooo real. I have Scottish relatives that would definitely give their approval!